The name Huldrych Zwingli may not be one of the better known from European history, and it is certainly not one that trips easily off the tongue, but he was an important pioneer of the Protestant Reformation and a contemporary of Martin Luther. 11th October 1531 was the day on which he was killed in a battle between Protestants and Catholics. 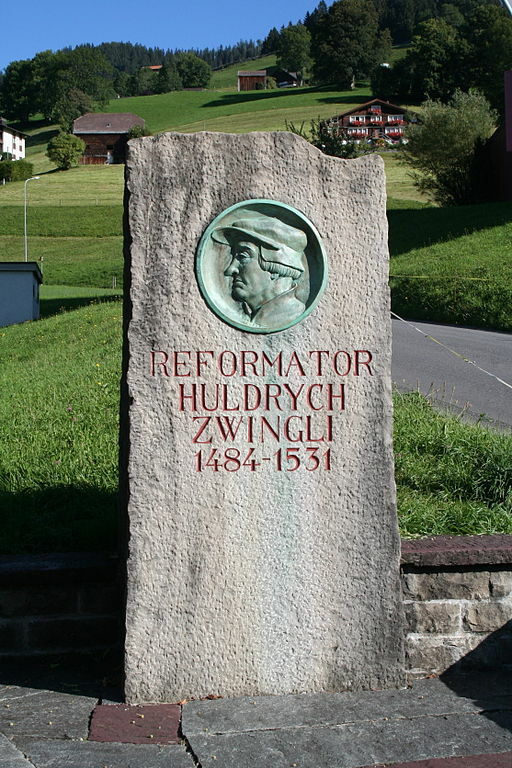 Huldrych Zwingli was born in St Gall, Switzerland, on 1st January 1484 and was thus two months younger than Martin Luther. He became a priest at the age of 20 and acted as chaplain to a brigade of mercenary soldiers. In this capacity he fought on the losing side at the Battle of Marignano in September 1515 when the Swiss had been hired to help defend Milan against an attack from France. As a churchman, Zwingli was anxious to institute reforms in what he saw as a corrupt Church, his basic tenet being that Christ, and not the Pope, was the head of the Church. As a soldier, he adopted a militant attitude to the task of cleaning up the Church, his activities including destroying organs and removing “graven images” from churches and then breaking them up. Zwingli went further than Luther in that he objected to the doctrine of transubstantiation (the belief that the bread and wine of the Mass were the “real presence” of Christ), and in 1524 he demonstrated his rejection of priestly celibacy by getting married. He gathered plenty of support for his views, and even incited revolts against such practices as religious fasting. He was particularly successful in the city and canton of Zurich.